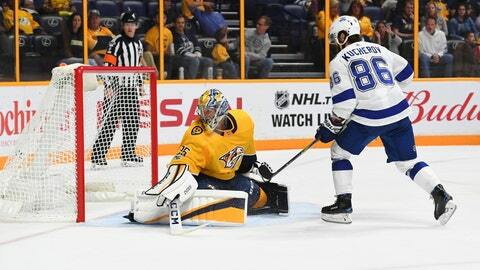 Tampa Bay Lightning right wing Nikita Kucherov (86) scores the game-winning goal past Nashville Predators goalie Pekka Rinne (35) in overtime at Bridgestone Arena. In Nashville, Nikita Kucherov scored 1:02 into overtime to lift Tampa Bay to the win. Kucherov also assisted on Alex Killorn’s two goals. Killorn opened the scoring at 5:49 of the first period, and then added another one at 13:51 of the second. Andrei Vasilevskiy made 26 saves for the Lightning. Miikka Salomaki and Colton Sissons scored for Nashville, and Pekka Rinne had 32 stops.